The GOP reveals a deep, talented field. Trump has a bad night. 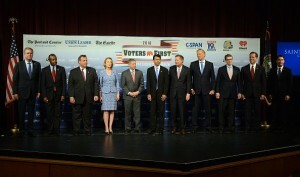 The first debate of the presidential season is supposed to help winnow the field of 17 Republican candidates, but perhaps Thursday’s most important result was to banish the GOP ghosts of 2008 and 2012. The field may be too large to fit in a single stage, but Republican voters should be pleased that they have several plausible would-be Presidents to choose from. Donald Trump was the leading story going into the debate given his recent surge in the polls, but we’ll be surprised if he stays that way after the debate. We’ve been wrong about Mr. Trump’s political staying power before, so perhaps his talk-radio-host admirers will keep promoting him. But the front-runner did not have a good night. Meanwhile, several candidates impressed by promoting their records and policy knowledge. Jeb Bush was the target of several pointed questions on immigration, Common Core education standards and his brother’s foreign policy. The former Florida Governor didn’t back down on any of them, and on education neatly repudiated federal mandates while still supporting high standards and school choice. He was especially good defending his goal of 4% annual GDP growth. Polarizing the electorate along ideological lines is a crowd-pleaser among GOP audiences, but it won’t defeat the Clinton machine without a message that attracts younger and minority voters. Ben Carson also stressed the need for a candidate who can be a national unifier. And while the neurosurgeon can come across as lacking energy, he too impressed with thoughtful answers and a good line about some of the half-brains he might have operated on in Washington. Debates are rarely definitive, especially this early. But the forum served the useful purpose of giving voters a chance to size up the field side-by-side for the first time. However the polls shake out, the good news for GOP partisans is that the quality and experience of their top-tier candidates is more than a match for Hillary Clinton—or even Joe Biden or John Kerry.